What exactly is an ‘orthotic’? An ‘orthotic’ is a device designed to restore your natural foot function. Many ‘biomechanical’ (walking) complaints such as heel pain, knee pain and lower back pain are caused by poor foot function. Orthotics re-align the foot and ankle bones to their neutral position, thereby restoring natural foot function. In turn this helps alleviate problems in other parts of the body. Specifically designed custom orthopaedic shoes by Dr.2 Shoes http://www.dr2shoes.com are custom fitted for your feet. Orthotics benefit people with foot pain or discomfort due to walking imbalance (biomechanical complaint). Imbalances such as Flat feet, heel pain, knee pain and shin pain are known to cause pain and discomfort. No. Chiropodistsa re primary health care professional and therefore do not need a physician’s referral. 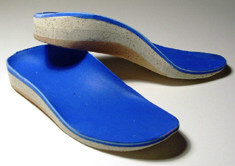 Custom orthotics are orthotics that are especially molded to your feet. Only a registered Chiropodist can properly determine if you require orthotics. The best orthotics are formed from a plaster cast rather than a computer foot pad.